KTM has increased the price of the 125 Duke by Rs 6,835 and now, it costs Rs 1.24 lakh (ex-showroom Delhi). 125 Duke Launched at an introductory price of Rs 1.18 lakh (ex-Delhi) on 26th Nov'18, the KTM 125 Duke is the smallest in the Duke range in India. The bike costs around Rs 33,000 less than the non-ABS variant of the 200 Duke. KTM has kept the styling of this motorcycle the same as the 200 Duke, presumably to keep costs in check. The KTM 125 Duke is India’s first 125cc motorcycle with a liquid-cooled engine. The 124.7cc DOHC motor churns out 14.5PS at 9250rpm, and 12Nm at 8000rpm. A six-speed transmission transfers power to the rear wheel via a chain drive. Just like the 200 Duke, the 125 also features an aluminium swingarm, WP upside down front forks and WP monoshock at the rear. The motorcycle comes to a halt using 300mm front and a 230mm rear disc, with single-channel ABS. The tyres are also the same MRF Revz rubber as the 200 Duke. The motorcycle competes with the Honda CB Hornet 160R, Suzuki Gixxer range and the Bajaj Pulsar NS 160 in the Indian market. KTM 125 Duke prices start at Rs. 1.25 lakh (Ex-Showroom). KTM 125 Duke is available in 1 variants and 2 colours. Share your experiences with Duke 125? The claimed ARAI mileage for the KTM 125 Duke petrol is 46 kmpl. Q. What is the gear shiftting ratio for baby duke? Q. Which petrol should I use for Duke 125? Q. Is Duke 125 value for money are not? Q. Duke 125 is suitable for men of height 5.4feet? Q. Which is best MT-15 or Duke 125? Is there enough KTM DNA in the 125 Duke to justify its high asking price of Rs 1.18 lakh? The KTM 125 Duke is styled along the lines of the 390 Duke, which itself was shaped after the 1290 Super Duke. There’s a host of sharp and steeply raked design elements like the LED headlamp, fuel tank and even the exposed tail section. KTM has deliberately kept the bodywork down to a minimum, as the exposed trellis frame really enhances the motorcycle’s sporty intent. The 125 Duke comes with a full TFT instrument console, a 13.4-litre fuel tank and a dry weight of just 137kg. The ergonomics is pretty upright with rear-set footpegs to give it a slightly sporty stance. KTM offers dual-channel ABS as standard too. The 125 Duke is powered by a 124.7cc, single-cylinder, liquid-cooled engine. It generates 15PS of power and 12Nm of peak torque. The engine is mated to a 6-speed transmission. Though it belongs to the 125cc segment, this motorcycle actually competes with 160cc motorcycles in our country. KTM has left no stone unturned when it comes to premium underpinnings as the 125 Duke comes with WP inverted front forks and WP monoshock at the rear. A generously-sized 300mm front and a 230mm rear disc combined with dual-channel ABS brings this baby Duke to a halt. Suzuki Gixxer: The Gixxer’s power output is also in the same ballpark as the 125 Duke, but the Austrian hooligan loses out on torque output by 2Nm. Just like the Honda CB Hornet 160R, the Gixxer packs a single-channel ABS. Though the bike has an information-rich instrument cluster, it loses out on LED lighting. However, it is more affordable than the Hornet, at Rs 87,871 (ex-showroom Delhi). Bajaj Pulsar NS 160: The Pulsar NS 160 enjoys the benefit of having an oil cooler, which helps in running the engine at higher rpms for a longer period without stressing it too much. With an output of at 15.5PS and 14.6Nm, it makes slightly more power and torque than the 125 Duke. The bike is also priced pretty competitively at Rs 85,690 (ex-showroom Delhi). However, it misses out on ABS. The KTM 125 Duke is a perfect motorcycle for beginners who do not want to miss out on top-class mechanicals and features. However, it is expected to be priced at around Rs 1.25 lakh. At that price point, there are more powerful yet relatively less sophisticated options out there. Only time will tell how the market responds to a premium, small displacement pocket rocket like the 125 Duke. We round up the five most surprising developments that took place in India’s two-wheeler industry this year! 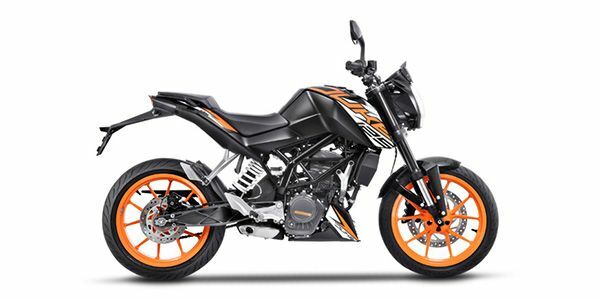 Confused about KTM 125 Duke?